A table of contents in an ebook helps readers navigate, especially on smaller reading devices. Most self-publishing platforms recommend adding a table of contents to an ebook. Amazon’s Kindle Direct Publishing has a help page, Create a Table of Contents in Word, which explains that Amazon now insists on ebooks having a TOC and explains how to create one. However, by using the automatic Microsoft Word function of ‘Insert a Table of Contents’, the formatting it creates is not desirable for an ebook. Word adds a lot of background code and additional styles that are unnecessary, and these elements are cumbersome to modify. A far better way to add a table of contents to an ebook using Word is to add one manually. This creates a clean, lightweight TOC, without any background code being added, and can it be done in just a few simple steps. 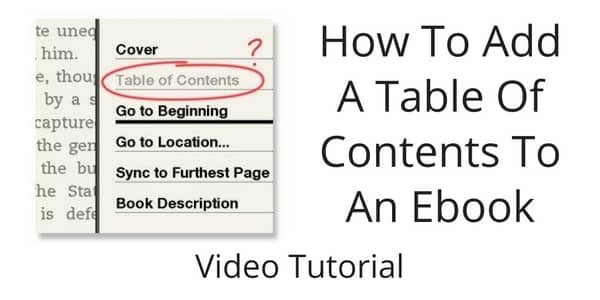 Watch the video to see how you can add a clean table of contents to your ebook. 1. Make sure all chapter headings are styled in Word as ‘Heading 1’. 2. Check Word’s document map to ensure all chapter headings are listed. 3. Select ‘Heading 1’ in Word’s Styles Drawer, and ‘Select All’. 4. Use the keyboard ‘Control C’ to copy. This will copy all the chapter headings. 5. Paste into a text editor using ‘Control V’, and then convert to plain text. Then select all, and copy. 6. Paste the chapter headings into the ebook document. 7. Select each chapter individually, and add a hyperlink from the document headings. 8. Your clean table of contents is complete.